Linda McMahon had contributed heavily to Donald Trump's 2016 election effort. At America First Action, she could play a similar role in his 2020 bid for re-election. A multimillionaire, McMahon contributed heavily to Trump's 2016 election effort. At America First Action, she could play a significant role in the president's 2020 bid for re-election. "We're staying together," Trump said. Along with her husband Vince, McMahon ran the hugely successful World Wrestling Entertainment company, negotiating television rights and merchandising contracts. 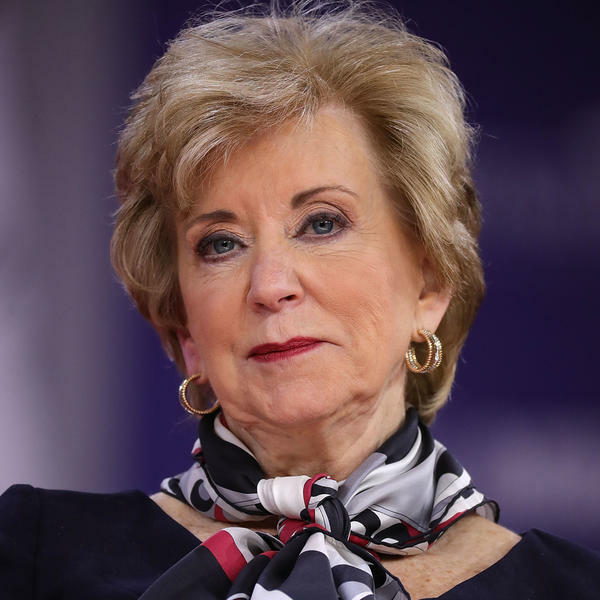 She twice ran unsuccessfully for the Senate from her home state of Connecticut. "The opportunity to lead the agency in supporting America's small businesses has been immensely rewarding," McMahon said in a statement. She pointed to surveys showing high levels of optimism among the country's small business owners. "They are investing in their companies and their employees — raising wages, providing bonuses and benefits, and creating more jobs," McMahon said. Her resignation will take effect on April 12. Trump said he would announce a nominee to replace McMahon in the near future. "I wish to thank the President and I will continue to be a strong advocate for him and his policies," McMahon said. Trump has proposed cutting the SBA's budget next year by 5 percent. White House reporter Ayesha Rascoe contributed to this report.